Glossostigma elantinoides, commonly known as glosso, originates from New Zealand where it can be found growing in bogs and swamps. It was not used in aquaria until the late 1980s when Takashi Amano imported it to Japan and began creating amazing aquascapes carpeted with the diminutive plant. 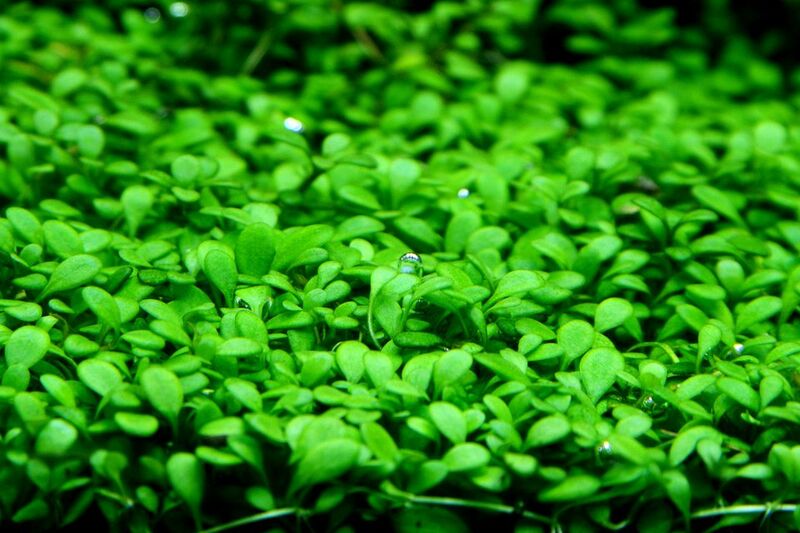 Glosso is now popular worldwide and is considered one of the most popular foreground options for planted aquaria. When provided with plenty of light and nutrients, glosso will remain short and compact, no more than an inch high. Given good care, they will spread like a carpet across the aquarium floor. The leaves are small, tongue-shaped, and petiolate (meaning the leaf has a stalk that attaches to the plant stem). In healthy plants, the leaves are bright green and will produce bubbles readily. This plant should be used as a foreground plant, and only placed where there is plenty of light. When the light is not strong enough, or the plant is shaded by other plants and decor, glosso will grow vertically, becoming spindly and unattractive. For this reason, take care when placing glosso to ensure it is not shaded from the light source. Another important factor in placing glosso is using a nutrient rich substrate and planting the tiny shoots deeply. Iron is particularly important for this plant to thrive. Some successful plant growers and breeders have recommended Flora-base as a substrate medium. ADA Aqua Soil and Power Sand are also recommended substrates. ADA Iron Bottom is an excellent iron supplement for any substrate you might choose. The substrate should not be too coarse. When initially purchased, glosso is usually potted. Remove from the potting material, then separate into individual plants by snipping them apart so each is a single set of leaves with a root. Individual plants should be spaced about 1 cm apart in areas where they will receive full light. Using tweezers, place each plant deeply in the substrate taking care that no part of the root is exposed. The leaves should be just barely visible and lay right on the substrate. Some bury the entire plant, then gently wipe away the enough of the substrate to just expose the leaves. It is said it's impossible to plant glosso too deep. Light is the key to success with Glosso, as well as a nutrient-rich substrate and the use of CO2. Without additional CO2, algae can become a problem, and growth will be much slower. CO2 should be at a level of 20-30 ppm at a minimum. The water should be soft and pH slightly acidic. Lighting should be at least 3-4 watts per gallon to ensure proper horizontal growth. If plants begin growing vertically it is an indication of too little light. Leaves turning darker generally are an indication of too little iron. Yellow leaves are also a sign of too little nutrition. Thin, slender leaves will occur when too much CO2 is present. A rapid grower when light and nutrients are plentiful glosso propagates by sending out lateral shoots. Higher light will stimulate low compact growth, while too little light will cause glosso to grow upwards, looking pale and spindly. As the plant grows, it will often grow over itself and should be trimmed to keep the plant dense and low to the tank bottom. Fertilizers in the substrate, as well as liquid fertilizers such as Natural Aquarium Vital will help promote healthy growth.